Blogger Template - Blanter Wisdom template that claimed to be a comfortable blogger template, the creator of Blanter Wisdom template is the work of idblanter.com. In this article I will share this Wisdom Blanter Template for free! 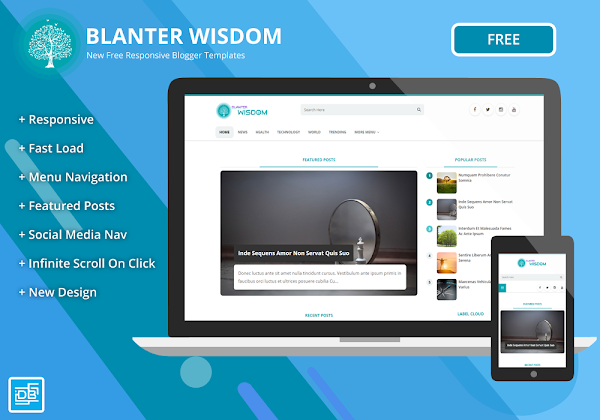 Surely you want to feel the true fact that this template is claimed to make it comfortable, of course you are curious about the following features that have Wisdon's Blanter Template. Are you sure you don't want to try to feel the sensation of the Blanter Wisdom template? Haha, this template uses a mixed design, combining ordinary design and Material Design design. Featured Featured Posts are also modified and look very modern and responsive. The Clean and Unique Display Design will make your blog more comfortable to see with forms of images that are not squares, make the display more smooth and light. The effects of the Wisdom Blanter Menu are also unusual with special scripts that make the hover effect come alive.